Terrestrial primary production is a fundamental ecological process and a crucial component in understanding the flow of energy through trophic levels. The global MODIS gross primary production (GPP) and net primary production (NPP) products (MOD17) are widely used for monitoring GPP and NPP at coarse resolutions across broad spatial extents. The coarse input datasets and global biome level parameters, however, are well-known limitations to the applicability of the MOD17 product at finer scales. 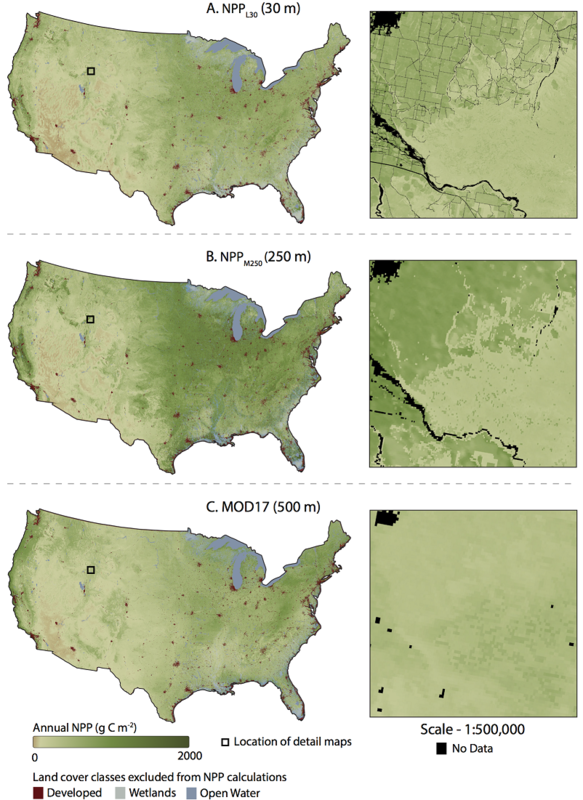 We address these limitations and create two improved products for the conterminous United States (CONUS) that capture the spatiotemporal variability of terrestrial production. The MOD17 algorithm is utilized with medium resolution land cover classifications and improved meteorological data specific to CONUS to produce: a) Landsat derived 16-day GPP and annual NPP at 30 m resolution from 1986 to 2016; and b) MODIS derived 8-day GPP and annual NPP at 250 m resolution from 2001 to 2016. Biome specific input parameters were optimized based on eddy covariance flux tower-derived GPP data from the FLUXNET2015 database. The Landsat productivity dataset is available for CONUS in 16-day and annual time steps. The MODIS 250 productivity dataset is available for CONUS in 8-day and annual time steps.